Last weekend we managed a flying visit to Robert’s Field, a small nature reserve managed by the Lincolnshire Wildlife Trust just off the A1 about 20 miles to the south of Grantham on a minor road between Holywell to Pickworth. This site is a limestone grassland which has been restored with a lot of effort and dedication by the Trust following the damage caused to this ancient meadow through conifer planting in the 1960’s. The work is ongoing but the result already is a wonderfully diverse limestone grassland with a wide range of wildflower species and simply teeming with butterflies. The site is accessed along a minor road and the meadow is approximately flanked by woodland on either side – it would be fascinating to go along one evening and see what bats could be recorded as the juxtaposition of woodland and such invertebrate rich, species rich grassland is likely to be perfect for a range of species including the noctule, pipistrelles and myotis species. Hopefully there will be a report on this to follow! The view across the reserve was dominated by colour, from the lesser and greater knapweed, the scabious, the creeping thistle and the ladies bedstraw set against the soft brown of dried grass heads and the already-rattling brown seed-cases of yellow rattle. 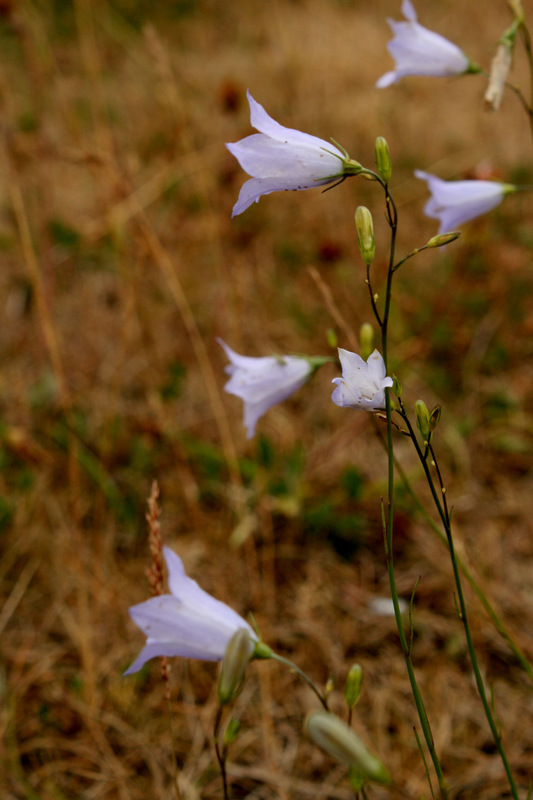 More delicate limestone species were to be found lower in the sward; the incredibly delicate eyebright and gently nodding harebell, creeping restharrow and common centaury. 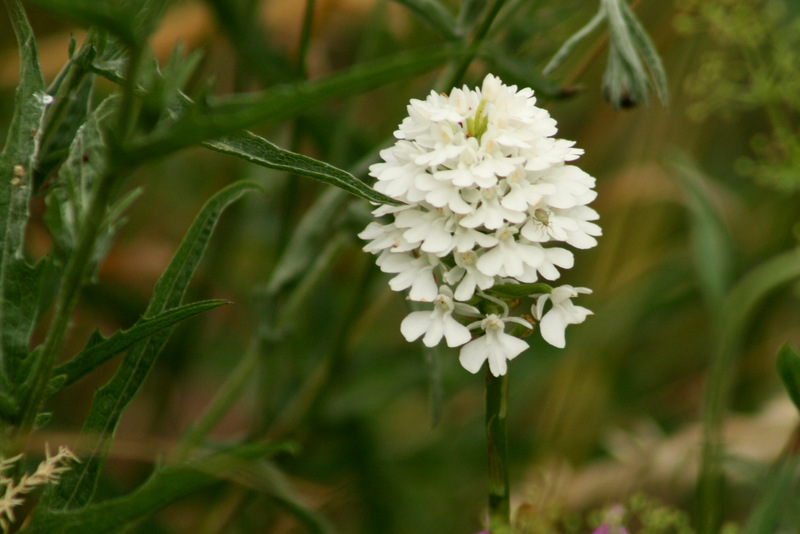 The star species would have to be the pyramidal orchids which scattered themselves humbly throughout the grassland with the rest of the wildflowers; my particular favourite was an all-white specimen close to the exit. Another interesting species was the knapweed broomrape; this looks to the unaccustomed eye rather like the dead flowering stem of another plant, perhaps even an orchid. In fact, this is the plant very much alive. Most plants are green from the chlorophyll which is the pigment critical to the capture of carbon through sunlight, effectively providing the plant with its food. Broomrapes are one of a number of parasitic species – the yellow rattle being another example – which tap into the roots of other plants and steal the nutrients from them. They are this brown colour because they simply do not need to make chlorophyll, they obtain their food through theft rather than thrift! There are a number of broomrape species in the UK and they do vary on which species they parasitise. 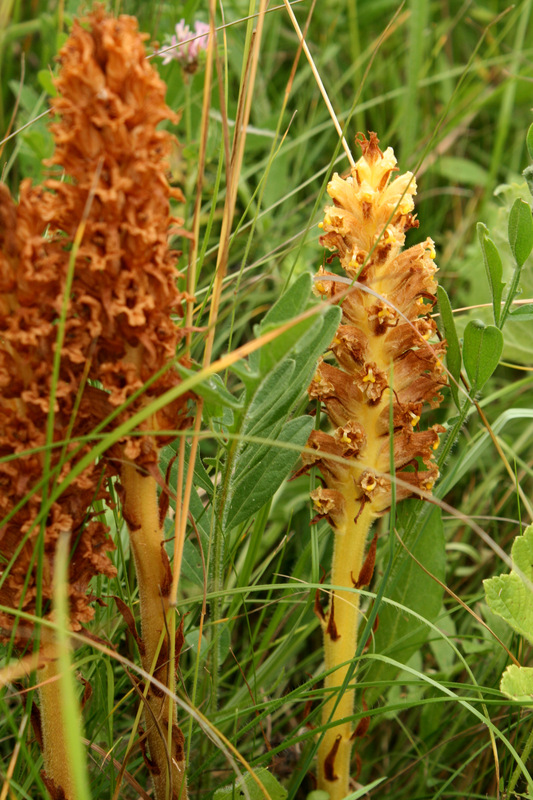 This is the knapweed broomrape and its host plant was present in abundance on this site. The main reason for our quick stop-off however was to look for the butterflies. It was cooling and slightly breezy by the time we arrived with the result that many of the butterflies were resting low to the ground; walking along the track scattered them to the air in 2’s and 3’s with every footfall. This is, without a doubt, one of the most butterfly-filled fields I have ever walked through! Meadow browns, gatekeepers and ringlets were present in profusion, along with countless small skippers which flitted from flower to flower. 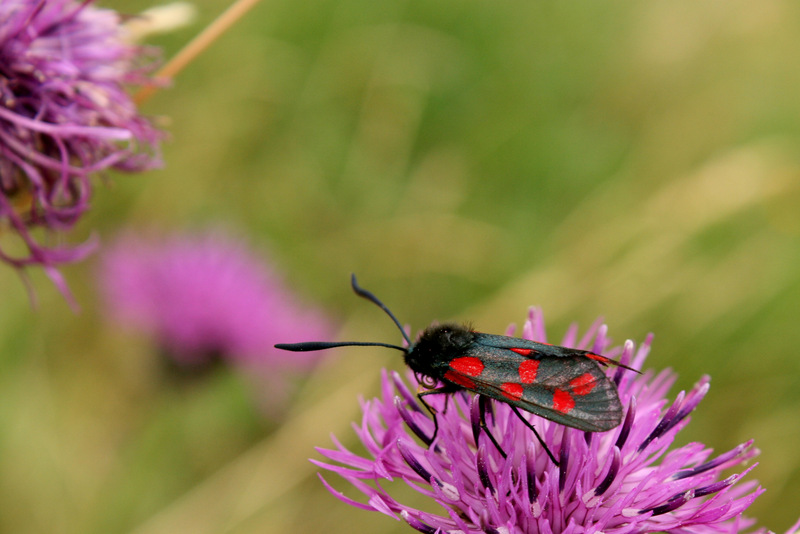 It seemed that every other grass stem had attached the cocoon of a six-spot burnet moth, often with the remains of the pupae still visible, with the result that every other flower seemed graced with one of these beautiful day flying moths. But the species we had really come to see kept flying away across the field, sighted only as a large light-brown butterfly which put 30 metres between us with ease on its powerful wings. 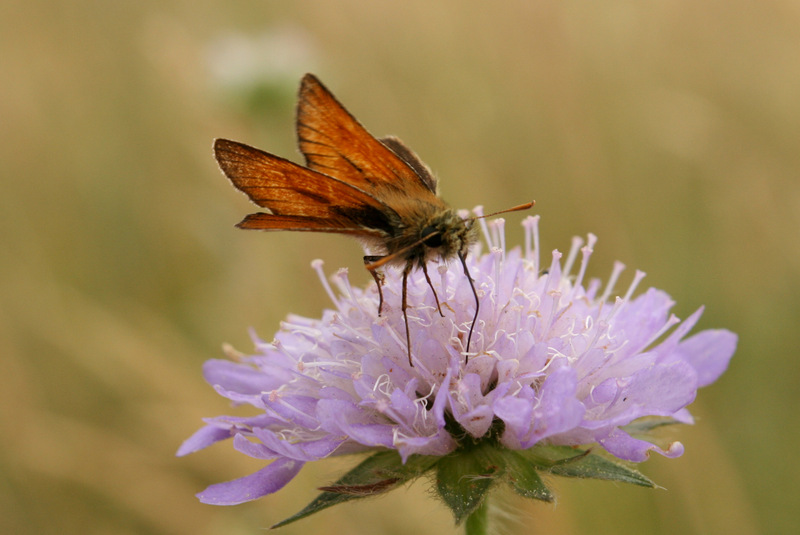 Eventually, on the loop back towards the car, we finally found one stationary on a purple flower of knapweed. The dark green fritillary. This is one of the nine UK fritillary species (if you count the Duke of Burgundy) and is one of the more common although it was considered to be extinct in Lincolnshire until recently. 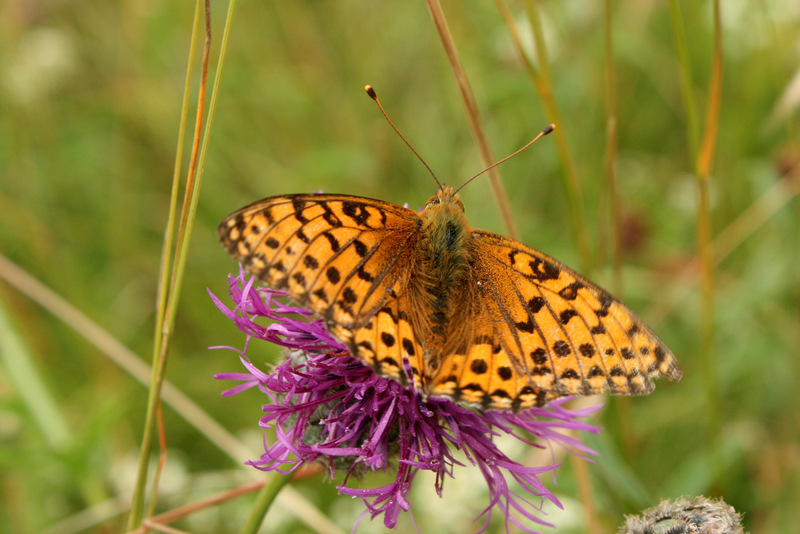 There is some debate over whether the dark green fritillaries in Robert’s Field were introduced or whether they have made their own way to the site, but their presence amongst the more common species goes some way towards restoring the number of butterflies which were once present on this site; 25 were recorded in 1950 although another 5/6 were thought to occur. This list included chequered, dingy and grizzled skippers, brown argus, Duke of Burgundy, green hairstreak, pearl-bordered and silver-washed fritillaries and marbled white. The green hairstreak still has an inland stronghold on this site and, although its flight period is over for this year, I am hoping to go in search of them at the end of May next year! 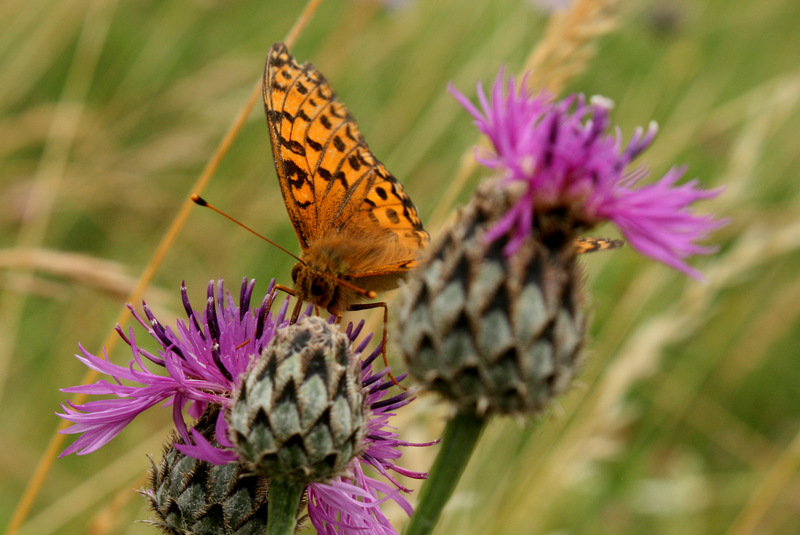 The dark green fritillary is, like all of the family, a dappled chequerboard of black and orange with no dark green to be seen when the butterfly rests with wings open upon a flower. The dark green which gives this butterfly its name comes from the underside of the wings where a dark green tinge, almost like a dusting, colours the lower portions of the wings closest to the body. This species can often be found feeding on thistles and knapweed whilst the larval food plants are violets such as dog-violet. Their key flight period is the first 3 weeks of July but they can be seen on the (increasingly tattered) wing into early August so there is still time to see them this year! To read more about Robert’s Field, visit the Lincolnshire Wildlife Trust web page here; you can also find information on where to find the site. Access is through a wooden gate towards the northern end of the field, next to a pull-in which can fit a couple of cars. Be careful not to park on the grassland verges which are also fantastically diverse wildflower sites in their own right and worth an inspection if time allows. 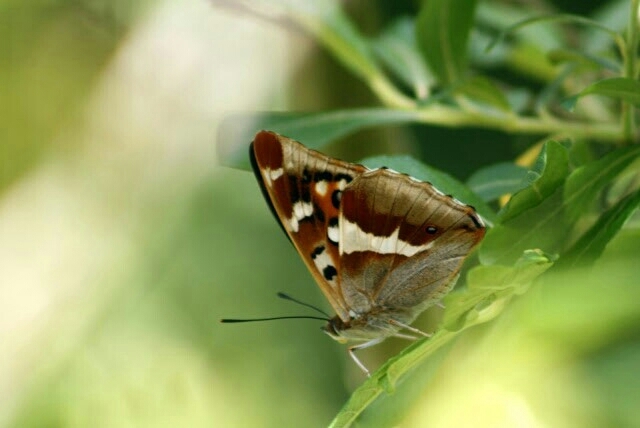 The purple emperor (Apatura iris) is not the rarest butterfly in the UK – that rather dubious accolade would go to the high brown fritillary although there are far too many other species, such as the black hairstreak, in close contention. But the purple emperor is one of the largest and certainly one of the most impressive. 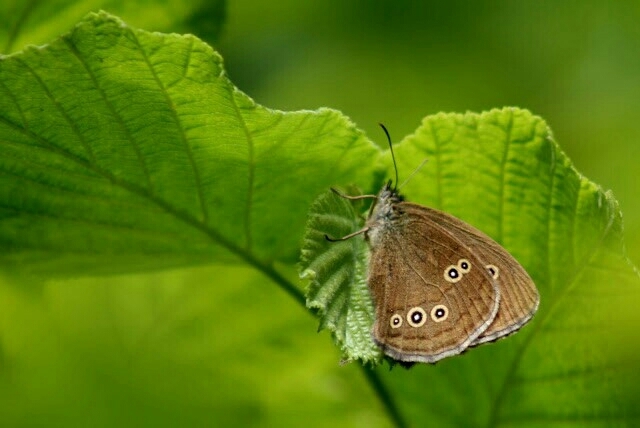 It is a woodland butterfly, favouring deciduous woodlands with a dominance of oak or beech although a good supply of willow, the larval foodplant, is another requirement. Perhaps it is this habitat, the high treetops in mature woodland glades, which makes the species all the more regal as it descends and deigns to be appreciated before ascending once more. They are found in mature woodlands through southern England with occasional colonies elsewhere in the country and, luckily, one of these is only a 40 minute drive from Grantham. We took a drive down to Fermyn Woods on Saturday, arriving around 10am, and were lucky enough to spot a male purple emperor settled upon a damp digging to the side of the trackway within 100m of the car. The males are seen most frequently as they come to ground to take moisture, nutrients and salts from damp ground and animal droppings – a behaviour which spoils the regal image just a little. The remainder of the time, the adults spend high in the canopies, feeding upon the aphid honeydew and this is generally where the females will stay – they could be seen occasionally breaking the canopy cover before returning and remaining on high. 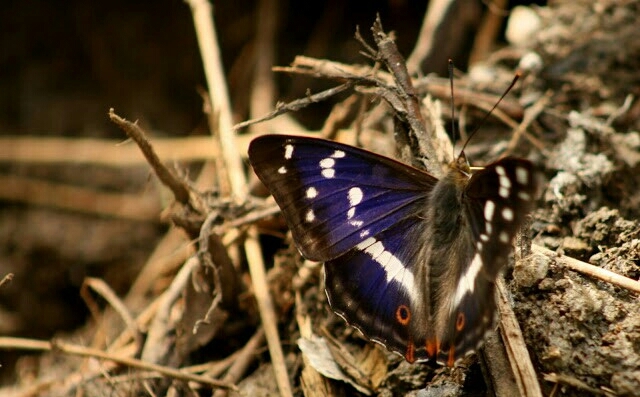 The purple emperor is very darkly coloured, almost black, with patterning of white and orange on the top of the wings. The underside are a magnificent rich marbled motif of brown and white, almost as spectacular as the open wings. But when the light catches the wings of the males, the reason for their name becomes apparent as a sheen of purple washes across the wings, marking this out as one of the most spectacular butterflies you are likely to encounter. As we walked amongst other enthusiasts watching the paths and the canopies, we saw another two in flight, along with many other butterflies including white admirals, ringlets, countless skippers and speckled woods. The best time to see the purple emperors is around now – the peak date for sightings is given as the 13th July – and they are generally to be found on the ground during the morning when the sun begins to heat through. The ride which runs from east to west through the middle of the woods was the place to be although the woods have a network of paths which are worth exploring for their range of wildflowers including meadowsweet, perforate St John’s wort, hedge woundwort and red campion.